Residents and Lebanese army members inspect a damaged area caused by two explosions in Beirut's southern suburbs, Lebanon, Nov. 12, 2015. 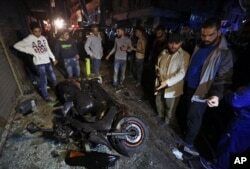 The Islamic State is claiming responsibility for twin suicide bombings in a Beirut suburb Thursday, killing at least 41 and wounding more than 200. The militant extremist group's claim has not been independently verified, but it follows the same pattern as those of other IS terrorist attacks. The blasts targeted Burj al-Barajneh, a busy commercial and residential neighborhood controlled by Hezbollah, whose fighters back Syrian President Bashar al-Assad. Police said there were two explosions minutes apart. The body of a third attacker whose suicide belt did not detonate was found in the rubble. Survivors reported blood and bodies everywhere; one man said he thought the world was coming to an end. An official with the mainly Shi'ite Hezbollah said Thursday's terrorist attack would hardly deter the group from going after the mostly Sunni Islamic State. The Burj al-Barajneh section of Beirut has been hit by terrorism in the past, and Sunni militant groups have threatened to carry out more attacks. The White House condemned "in the strongest terms" Thursday's "horrific" attack and sent its condolences to the families of the victims. Former Lebanese Prime Minister Saad Hariri also condemned Thursday's blasts, calling them "heinous terrorist attacks." He said on Twitter that "targeting civilians is a vile and unjustified act." The U.N. special coordinator for Lebanon, Sidrig Kaag, also condemned the attack. "Lebanon's unity, stability and security need to be supported and shielded at all times," she said. People gather near the site of a twin suicide attack in Burj al-Barajneh, southern Beirut, Lebanon, Nov. 12, 2015.